You might have been wondering about the recent look and texture of your hair. It is getting so oily and you have begun the search for a remedy. Oily scalp isn’t really something everyone likes as it attracts dirt and may trigger hair fall among others. Welcome to today’s blog topic where we have outlined several home remedies and DIY tips for oily scalp treatment. This has been recommended by some beauty experts and it seems to have solved the problems of many with oily scalp and hair. 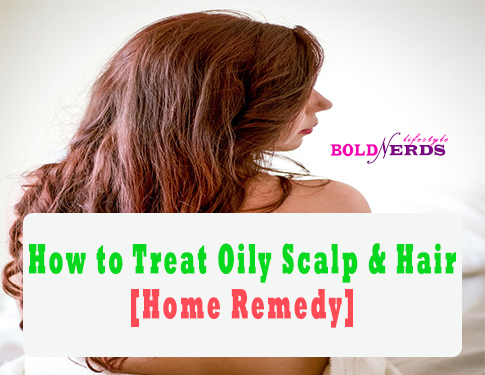 So if you are ready to try this DIY tips to get rid of your oily scalp, then this is how to go about it as many with similar problems solved theirs with this DIY remedy. Tea contains tannic acid that removes excess oil from the scalp and hair. This formula has worked for many who were dealing with oily scalp and hair. All you need is a tea bag and water. Put a cup of water on the stove and when it gets hot, turn off the stove and dip your bag of tea into it. Allow it to cool down and rinse your hair with it. Make sure you wash your hair thoroughly, then wait for 30minutes and rinse with normal water before using shampoo. Lemon contains vitamin C which is required for hair growth. Lemon has also been used for treating oily hair and giving it a shiny look. This is what you need to do. Cut open lemons into two equal sizes and squeeze out the juice into a cup. Add a reasonable amount of water to your lemon but make sure you have enough lemon juice present in the solution. Now rinse your hair with the lemon solution thoroughly. Wait for 30minutes or more before washing with shampoo. In our previous article, we discussed how Aloe Vera can be used to treat stretch marks. But today, we’ll be looking at how to treat oily scalp and with Aloe Vera. Aloe vera has numerous benefits for both skin and hair. Have you thought about the reason why many cosmetic companies employ the use of aloe vera in their production? Well, simply because it has a healing property and its suitable for both hair and skin. Get enough gel from aloe vera plant and add 1 or 2 tablespoons of lemon juice. Mix properly and apply this to the root and tip of your hair and scalp. Wait for 30 minutes and wash off with shampoo. Do this 3 times a week for great results. ACV which is an acronym for Apple Cider Vinegar has long been used for many health issues. Arguably, ACV with the mother (this is AVC that hasn’t been diluted, i.e. it contains all nutrient and vitamins) has been said to resolve hair loss among men. ACV also adds a shiny look to hair and improves hair texture. Using 1 full cup of water, add a half cup of ACV and wash your hair with this solution. Leave it in your hair for as long as you want. Vinegar is neutral and will not harm your hair. This remedy should help you get rid of oily scalp and hair. I have personally tried washing my hair with vinegar and the outcome was amazing. I prefer using warm water as compared to cold water. The last but not least on our list of top 5 DIY tips for treating oily scalp is by using alcohol. This is a great remedy for oily scalp treatment but may not be your favourite if you’re not so cool with the smell of alcohol. With a cup of water, add a tablespoon full of alcohol and stir. Wash your hair with this remedy and rinse after 20 minutes. With this, you should be able to get rid of oily scalp and prevent your hair from catching more dirt. We hope you enjoyed our article on “How to Get Rid of Oily Scalp and Hair”. We would love to send you periodic tips on beauty, fitness and healthy living. Don’t miss our next tip, subscribe to our newsletter below. It only takes a few seconds! Don’t worry we respect your privacy and we’ll not spam you. Have you shared this with a friend? It only takes a second and it doesn’t hurt. Thanks for sharing!